The Laguna, a classic hourglass whirlpool design, puts all the benefits of a larger whirlpool into a compact, standard replacement size bath. This whirlpool offers seven water jets or a combination of water and air jets. 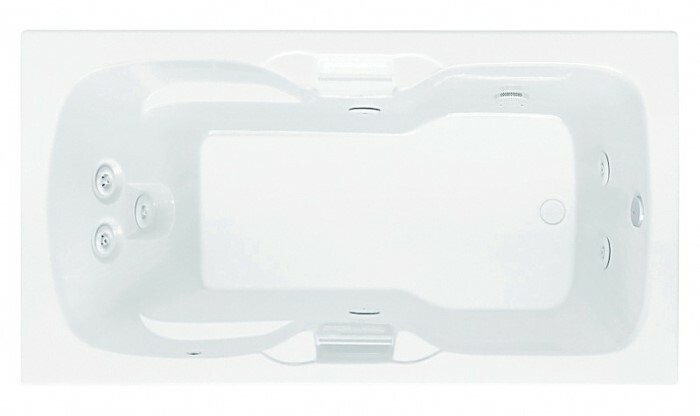 The Laguna features a deeply contoured bathing well and built-in lumbar back support. With seven jets strategically placed to target hydro therapeutic jet action to the neck, shoulders, back, legs, knees and feet, the Laguna provides welcome relief from the tensions of the day. Built-in grab bars for convenience. Tub Size: 59 1/2" x 31 1/2" x 22 1/2"